Koreans often make baekseolgi-tteok to celebrate a baby’s 3 week birthday (saei rye in Korean) or any child’s birthday, but it’s most often traditionally prepared to celebrate a baby’s 100 day birthday (baek il in Korean). The white cake represents purity and perfection and is attained by using fluffy steamed white rice flour and a few other ingredients: sugar, salt, and water. This rice cake was meant to be shared with many people because it’s believed that the more people who share it, the longer life the baby will have. If you’ve already made my mujigae-tteok (rainbow rice cake), I think making baekseolgi-tteok may be too simple for you. I added some dried fruits and sliced almonds to this rice cake to make it more tasty and colorful, but if you want to make it in the traditional Korean style, leave them out. Let me know if you make this for your lovely family members, friends, babies, your parents, or even your co-workers! Impress me and my other readers. A note about short grain rice flour: the flour you buy at your local store or the flour you make may have more or less moisture in it than the rice flour I use in this recipe. This is because of many different things like how long it’s been in the freezer in the store, or the atmospheric conditions where you live. You may need to add more or less water, depending on how dry or wet your short grain rice flour is. Thaw out the package of frozen rice flour and put it into a large bowl. Add water and salt. Mix it all up and press out any wet lumps by rubbing the lumps gently between your palms. Repeat until all the lumps are broken and the rice flour is uniformly wet. Sift the rice flour twice, then add sugar and sift once more. Add 10 cups of water to the bottom of a steamer and bring to a boil. When the water boils, place a wet cloth or cheese cloth over the rack and put the cake ring on top. Put the sifted rice flour into the ring and flatten it out so the mixture sits level. 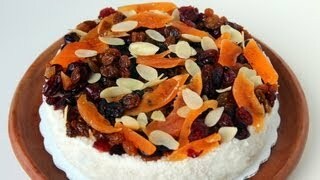 Add colorful dried fruits and nuts on top, if you want them. The traditional Korean style doesn’t use them, but you can add them if you like. Cover the cake with the cloth and steam over high heat for 30 minutes. Turn off the heat and open the lid. Uncover the cake and carefully lift it out using the sides of the cloth. Place it on a plate or cakeboard. Wait a few minutes for it to cool down before gently pulling the cloth out and removing the cake ring from the cake. Serve with tea, coffee, or milk. Freeze any leftover rice cake: if you freeze it when it’s still fresh and fluffy, it will still be chewy and fluffy when it’s thawed out. Cut the rice cake into individual servings and wrap each piece in plastic wrap. Put the pieces into a plastic bag and keep that in the freezer. Thaw it out at room temperature before serving, or reheat it in a steamer or microwave oven. Rinse and drain some short grain rice a couple of times and soak overnight (10-12 hours). Drain the water and grind the rice very finely. Use it right away, or immediately store in the freezer. Posted on Thursday, October 18th, 2012 at 12:10 am. Last updated on August 7, 2017. Posted October 1st, 2018 at 11:03 pm | Log in to reply. can i make this using brown rice? Posted October 6th, 2018 at 3:33 pm | Log in to reply. It won’t work, so please take a look at the ingredients to see what you need! Posted April 26th, 2018 at 6:53 am | Log in to reply. How much short grain rice should I use to make frozen rice flour? Is it the same amount :4 cups and 1 TBS? Posted April 26th, 2018 at 6:48 am | Log in to reply. If I’m using pressure cooker to steam the cake, how much time should I use? Posted March 11th, 2015 at 9:34 pm | Log in to reply. Hi I practiced the cake without toppings. The cake turned out cracked all over the top. Any advice? Posted March 4th, 2015 at 11:29 pm | Log in to reply. I made it 4 times in one night to try to get it right. The first one was mushy, I added water. the second one was good but a bit dry. No water added. The third time it was like rubber, and it didn’t rise much. The last one was a big mistake, i added the sugar late and it got clumpy, so i rolled it into a log, steamed and cut into small pieces for soup. I have celiac ‘s so rice is the only type of cake or bread i can have. I really need to learn this and get it right like yours. Posted July 13th, 2013 at 5:12 pm | Log in to reply. I think this is the cake I loved as a child. The only difference is that the cakes my mom would get had raisins inside the cake. If I were to make the recipe with raisins, would you recommend soaking the raisins first as you would with fruit for an English steamed pudding? Posted July 14th, 2013 at 11:55 am | Log in to reply. You don’t have to soak them, you can just put them in directly. Steaming will give them enough moisture. Good luck with your rice cake, and let me know how it goes! Posted October 22nd, 2012 at 3:21 pm | Log in to reply. I’m not a big fan of desserts, but you might ought to give this a go with dates. I recommend honey dates. Or medjools if you’re a fan of something chewier. Posted October 22nd, 2012 at 2:51 pm | Log in to reply. Couldn’t find frozen rice flour in my korean grocery store, so used a rice flour off the shelf. 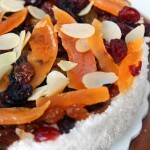 My rice cake looked beautiful with the fruits, but the cake did not steam properly. If I can’t find frozen rice flour is there a substitute or something I can do with the regular rice flour? Posted October 23rd, 2012 at 11:14 am | Log in to reply. Yes, as I explained at the beginning of the video, you will have to use rice flour which is soaked at least several hours, drained, and ground finely. Otherwise, the rice cake won’t cook properly no matter how long you cook. Posted October 25th, 2012 at 1:07 am | Log in to reply. hi maangchi.. i wanted to make this for my daughter’s 5th birthday this coming oct. 27.. i can’t find frozen rice flour.. we only have ordinary rice flour here. (not frozen) can i use that? and can i make this in advance, like a day before her birthday.. won’t it go off? i really wish to make this on her birthday.. we also have some korean friends that will come over.. i’d really appreciate your help.. thank u..
Posted October 25th, 2012 at 7:39 am | Log in to reply. I want to add my good wishes for your daughter, too! yes you can make this rice cake in advance but freeze it. If you freeze it when it’s still fresh and fluffy, it will still be chewy and fluffy when it’s thawed out.Thaw it out at room temperature before serving, or reheat it in a steamer or microwave oven. Posted October 26th, 2012 at 8:09 pm | Log in to reply. How many hours do I soak the rice flour in the water and what water do I use. Hot or cold? Posted October 20th, 2012 at 1:38 am | Log in to reply. @ Ms. Lim – I really enjoyed your long explanation about rice cakes! Maangchi! It looks so gorgeous, the white color! I have a question – if I made a much smaller cake, maybe three inches across instead of in an 8″ pan, would I still steam it for 30 minutes? Posted October 21st, 2012 at 9:09 am | Log in to reply. Yes, I would steam it for 30 minutes because it takes a while to cook any type of rice cake. Posted October 19th, 2012 at 2:30 am | Log in to reply. Is this frozen rice flour the same as mochi flour – sticky rice flour? We have health food stores here that sells rice flour, but I’m not sure what kind of rice it is. Posted October 20th, 2012 at 12:51 pm | Log in to reply. the frozen rice flour in this recipe is made by first soaking the rice grains in water to rehydrate them, drying off excess water, then grinding them. mochiko rice powder uses same type of rice (sweet rice), but the grains are not rehydrated before they are ground. Posted October 21st, 2012 at 9:12 am | Log in to reply. “Is this frozen rice flour the same as mochi flour?” no, it’s short grain rice flour. https://www.maangchi.com/ingredients/frozen-rice-flour If you use sweet rice flour (mochiko powder), the cake will turn out sticky and lumpy not fluffy. Posted October 18th, 2012 at 2:30 pm | Log in to reply. I’ve tried this recipe, it’s quite easy to make. I added too little of water and it’s quite dry, but the texture is like a spring. I’ll make it again someday. Maangchi, thanks for your great recipe! 감사합니다! Posted October 18th, 2012 at 11:44 am | Log in to reply. As a westerner I really have no idea what to expect from a fluffy rice cake like these. I love cooking and jump to try all your Korean recipes but baking sweets always scares me (even western types). Your mujigaeddeok video was so beautiful and now this one!!! Maybe I will buy some home-made mujigaeddeok from the Korean grocery store near me and try this taste and texture before making my own? Posted October 21st, 2012 at 9:14 am | Log in to reply. Posted October 18th, 2012 at 7:31 am | Log in to reply. Posted October 18th, 2012 at 8:55 am | Log in to reply. “I’m in the middle of monthly gathering with other chefs talk about Indonesian Cuisine” I’m so proud of you! : ) Is there any similar rice cake in your culture, Mariska? Posted October 19th, 2012 at 1:09 pm | Log in to reply. This recipe was originally posted on October 18, 2012 at 12:10 am by Maangchi. It was last updated on August 7, 2017. The video was watched 288,128 times on YouTube & has 3,383 likes!